I'm not sure about anyone else, but I'm a little bit tired of all the winter shenanigans , and I'm so ready for spring!! We got a new puppy last fall, who is now 85 pounds, at 8 months old, and having to put on 2-3 layers of clothing everytime I take him out, is getting really tedious. The pay off though is everytime we go out, he's so excited and happy to be playing in the snow , that it makes it worth it. Still....really want spring to arrive!! Concentrating and listing new upcoming shows always helps too. So please find below , a list of upcoming events and shows that I have lined up so far for 2019. I will update the list as other events come up. Greetings everyone. As I sit here and watch the snow falling outside my window this feels like the never ending winter ! I'm hoping this will be Mother Natures last winter encore and that spring will soon be on her mind. We've settled into our new home ( a few boxes left!) . I've set up my new studio, and it's wonderful. It's in the basement which I don't usually like to work in, but this one is big and bright , lots of Windows, and a huge bonus is that it has a fireplace! It's been amazing to work down there on cold winter days! I am really looking forward to moving outside though too and being able to paint in the yard again. So far I have 4 shows booked for this year, and I'm hoping to add a couple more along the way. I've also been toying with the idea of having an open house in the fall, but that's still to be considered . I've been teaching a lot already this year, and would also like to get things set up here so that I can offer classes in my home again. I'm hoping to get that all figured out by the fall as well! Bon Echo Provincial Park, Annual Art in the Park, July 27th, 28th, and 29th 2018 , Cloyne , Ontario. Breathtaking provincial park!! Dundas Artisan Market, Sunday September 9th, 2018, Dundas Driving Park, Dundas Ontario. That's it so far, and I will add any new events as they come up. Please also check out my Instagram page , as I post photos and events on it quite regularly , more than I do here on my blog site . Once again more than a year has flown by at warp speed! And it has been a bit of a roller coaster ride at times! I am now the President of the Women's Art Association of Hamilton, and have completed a year in this position so far. It has been an honour to work alongside some very talented and passionate women, and I look forward to one more year before I turn the reigns over to a new president who will continue to help move women artists forward in a creative and dynamic direction . I have had the great pleasure of teaching several more Encaustic workshops over the last year at the Burlington Art Gallery and the Cotton Factory as well, and I've enjoyed meeting some very kind and creative people during the process. I will be teaching more this coming fall , and I'm looking forward to setting up some more classes in the coming year also. We are moving to a new home in a weeks time, and packing up our current home has been all consuming, it feels like we live in a sea of boxes. I can't wait to set up my studio area , and decorate our new home and gardens. We will have just over a 1/4 acre, and I've been pouring through all my gardening books for ideas. So very exciting! But Better chance though of seeing more posts on Instagram , just way easier!! Soooo...a whole year has passed I'm embarrassed to admit, since I have written anything new, or updated my web//blog site !! I am always amazed at just how fast a year can go by, and what can happen and change over that time as well. 2105 was another year of big changes, new adventures with some exciting and some sad events in my life. In the Spring, my oldest son and I got to head out to Vancouver to spend a week with Family. I hadn't there in over 30 years, and it was incredible to go back and share this time with my son, and re-connect with some of my family. so many laughs, reminiscing, a few tears, and just a whole lot of fun. The week was over far to fast..
Another amazing highlight was my residency in Italy in June. I was Artist in Residence in the breathtaking village of Noepoli, high up in the Polino Mountains, in Southern Italy. Truly one of the most beautiful places I have ever been. The hosts of Palazzo Rinaldi, Raphaelle & Pina, were so kind and gracious, and it was a pleasure to stay in their ancient stone home with them. The residents of this medieval village were very welcoming, and loved to welcome us into their homes, and offer us coffee ( along with chocolate almond liqueur !) and cookies. Even with my extremely limited Italian, and their extremely limited English , we managed to communicate quite well, and our visits always ended with big smiles and photographs taken together, and warm hugs and kisses . Being in Italy was a magical time that allowed me to see so much of this beautiful country. We started in Florence for a few days, off to Venice, then Rome. Then down to southern Italy for my residency, and then off to Naples and the Amalfi coast to end the month off. The residency also offered me some much needed quiet time. Wandering through the village, sketching , painting on the terrace, taking it all in, gave me time to just sit and reflect a bit about my life, and choices, and offered me some clarity about a few decisions that I had been struggling with for quite some time. I hope to be able to return there someday very soon, as it will forever hold a special place in my heart. I am so truly grateful that I was given this amazing opportunity to spend so much time in such a wonderful country. It seems as soon as I returned to Canada, I hit the ground running and didn't really stop till Christmas. Family events & obligations, exhibits I was participating in, and part time work all seemed to contribute to the feeling of life suddenly moving at warp speed! Most importantly, 2015 also offered myself and my husband of 29 years , the opportunity to come back to each other and reconcile , and work out our differences, and start over so to speak to end up in a much better place together. We are working very hard together to keep moving forward....... something a year ago, neither one of us ever thought possible or that we would ever be able to do. So, now I am finally painting again, mostly of Italy right now!! My first show is in May, and I am looking forward to exhibiting my new pieces. I find it a little bit ( actually a lot!) hard to keep up with social media at the best of times , but I will try a little harder this year. I will also post a list of upcoming shows for 2016 after this post is completed. But I would also really like to add my Instagram account to this post, as I find it infinitely easier to post photos on, and it will be much easier for me to keep up with form of social media and much easier for people to see new artwork that I am producing. 2014 will forever be remembered as one of the toughest years of my life, full of heartbreak, broken promises, broken dreams, and the realization that there are questions that I will probably never have answers for. Maya Angelou once said" people may forget what you said, may forget what you did, but they will always remember how you made them feel"
And I am forever grateful for my wonderful sons, they are the loves of my life, my incredible family, and for for the handful of my generous and kind, amazing friends. You all went above and beyond to hug me, love me, and make me smile. I will always remember just how you made me feel. Happy 2015 everyone, don't forget to wish upon a star. May peace, light, love and laughter fill the whole year to come. I have posted some of my upcoming shows for 2015 below. I hope you can stop by one of them, and say hello. I will update this as more shows become available. thanks very much for looking at my blog! The following is a list of upcoming shows that I will be participating in for 2013. They are all juried art shows. The list will be updated and added to as more events become available. These are all wonderful art exhibits/shows and well worth visiting. I have been accepted into an Artist in Residence-Retreat program in Noepoli, Italy. Encaustic workshops will once again be offered this year in my studio and at The Burlington Art Gallery, Burlington Ontario. Welcome 2014! I get the feeling this is going to be a big year. One of changes , realized dreams, and of course some failures too. Failure at times can be tough, but also inspiring if looked at from a different angle, and learned from. For some reason, January h as a history of always being a tough month for me....and this January was no different! Record breaking cold that caused a pipe to burst in my 120 year old home, vehicle issues, and a ride in an ambulance and short hospital stay started my year off! I did, however hold two very successful Encaustic Workshops at the Burlington Art Centre. As always I had some very enthusiastic and creative students, and it was a pleasure to spend time with them. Now that it is February, I am hoping for a little smoother ride! I have so many painting ideas that I want to get started on, and hope that I can find the balance of time and family to create them. I am trying desperately to get some aspects of my life in order, because they have de-railed , and as a result have caused me to question some things and have made it quite difficult to concentrate on my art like I would like too. However, I do have faith that I can do this, and failure is not an option now. So on that thought, I wish everyone a wonderful year to come and I am looking forward to a creative and challenging new year. To view older posts and/or photos of work, please just "click" on the Older Posts prompt at the bottom of the page. This another version of a painting I did a few years ago. It is a beat up door downtown that has so much history. This painting is 10"x8" and is available for purchase. This is one in a series of smaller paintings I have started. It is 10"x8" and Has been SOLD. This painting has been SOLD. This is the first of three pieces that were created for an exhibit at Sketch Gallery, downtown Hamilton. 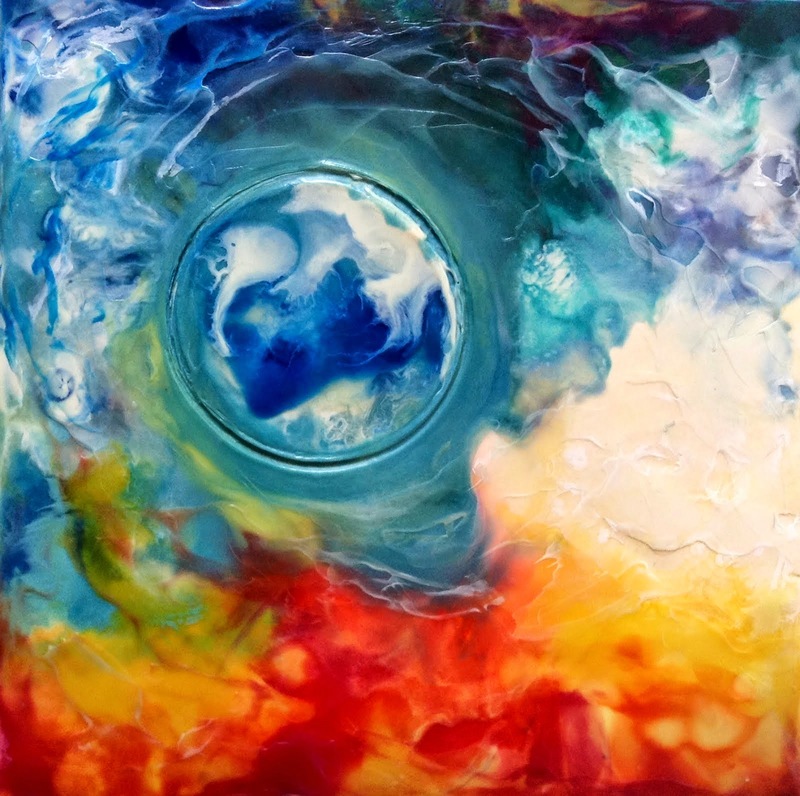 It is an encaustic piece, and working with the wax can sometimes feel like meditating to me. I can get lost in painting and moving the wax around. This piece is 8"x8" and is available for purchase. This painting has been SOLD. This is an Encaustic piece that was the second of three in a series for an exhibit. I love how the wax will sometimes reveal images to me while I am working with it! This piece is 8"x8" and is available for purchase. 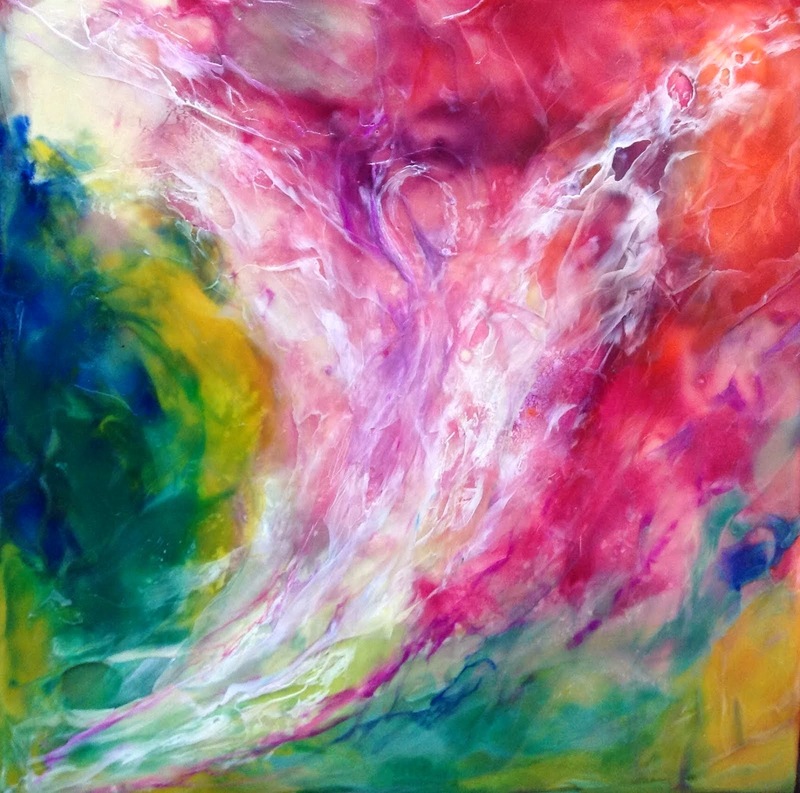 This is an Encaustic painting that was done for a gallery show. I created three pieces for this exhibit. Working with the wax is such a wonderful creative outlet, and the results are stunning.this piece is 8"x8" and is available for purchase. This painting has been SOLD. TO SEE SIMILAR PAINITNG in this series please visit my Instagram account : robbinsart100, thanks you! 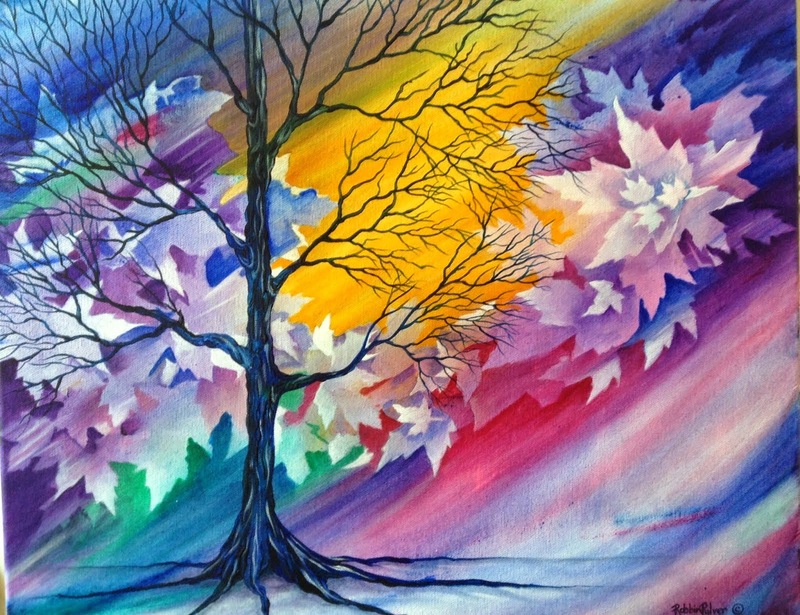 This painting was a joy to create, as have all the paintings done in my new trees series. It is 30"x 20", acrylic on canvas, and is available for purchase. 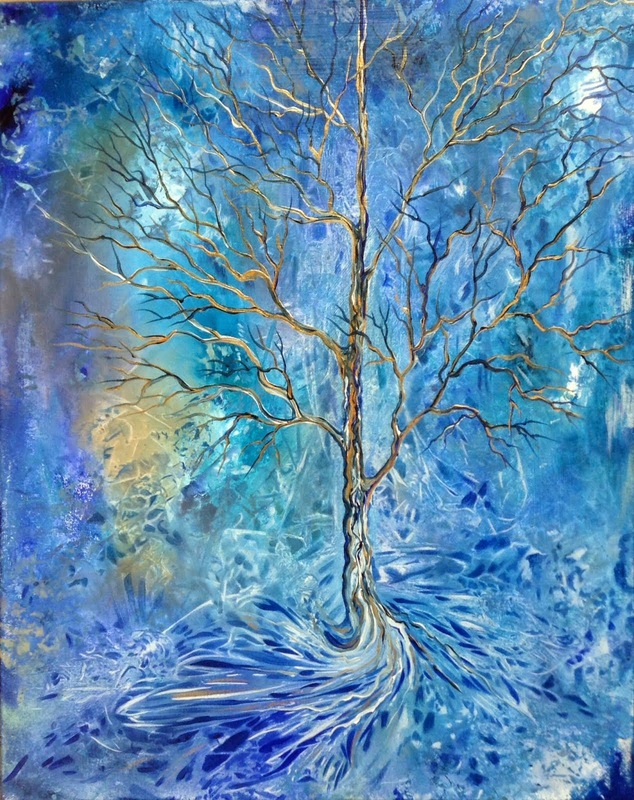 Another Tree series painting. 16"x20",Acrylic on Canvas, and is available for purchase. 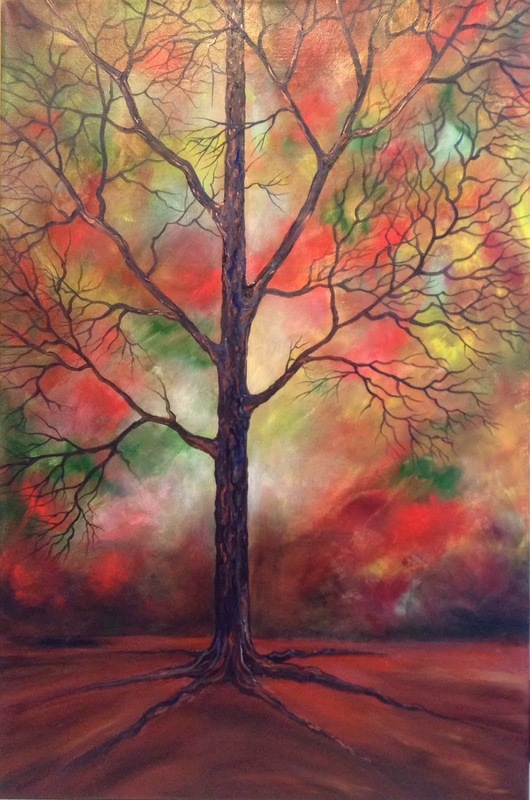 I recently started a new series on trees, and this is one of the paintings. Acrylic on Canvas, and has been SOLD. Private collection. While out on a walk earlier this spring with one of my sons, we came accross this open doorway that lead inside this old century building. Even though it was brutally cold out, something about the pink of the walls made it seem just a little warmer! They actually had striped wallpaper on them and there was a salon at the top of the stairs. I changed it a bit, as I like to do and make it my own view! It is 16"x20", acrylic on canvas, and is available for purchase. This painting has been SOLD. New for 2011. This old factory has been re-done into loft apartments, and was right behind my oldest sons apartment building. He lived in a very old neighbourhood in London. Whenever we would come out of the building into the alley I just always seemed attracted to the look of this spot. It is 16"x20", acrylic on canvas and was on display at THE ART GALLERY OF HAMILTON.It is available for purchase. Inspired by my sisters lovely old home, this window has captivated me many times. I have painted 3 other versions of this view, and it still inpires me! It is 16" x 20", acrylic on canvas, and has been SOLD,Private Collection. New for 2011. Spring can take a long time to get here sometimes, but when it does, it is so wonderful to just open up all the doors and windows, and let the fresh air in! This painting is 18" x24", acrylic on canvas and has been SOLD, private collection. This painting is very quiet, much like winter feels to me. It's like the world goes to sleep and rests for a few months. This farm is not very far from where I live. It is 16"x20", Acrylic on canvas, and has been SOLD/ Private collection. I think the title says it all! We should all keep ourselves open to new possibilities. This painting is 18"x24", Acrylic on Canvas, and is available for purchase. This painting was inspired by my Grandmother. Whenever anything went wrong or didn't work out the way it was hoped too, she would always tell me that another door would open for me, and it always seemed too! This painting is 18"x24", Acrylic on canvas, and been SOLD,Private collection. This spring was a very wet one this year, and the window in my studio is at just the right height that when I look out of it, I only see the top half on anyone/thing walking by. I saw a lot of umbrellas go by this spring, and that was the inspiration for this piece! It is 16"x 20", acrylic on Canvas, and has been SOLD< private collection. 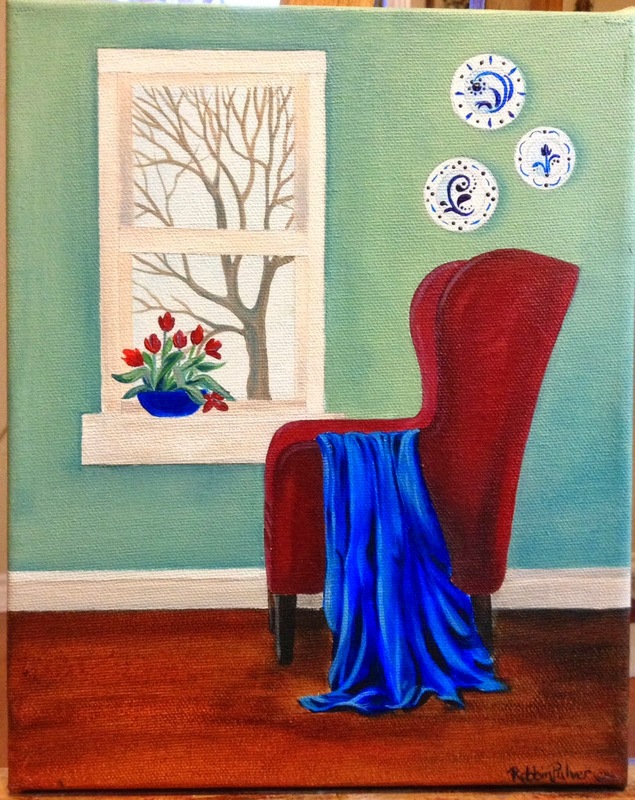 This painting was inspired by a trip to an antique shop. There were old doors, and window frames, mantles, and various other fixtures crammed into this tiny shop. And there was inspiration everywhere! When I was looking around I couldn't help but feel the history from some of these pieces, and I wondered about what memories they held from the life they had when they were in someoens home. This painting is 18" x 24", acrylic on canvas, and is available for purchase. This painting was a real challenge to paint! The shadows were difficult, and all the angles really tested me, but I am pleased with the end result. This painting is 12" x 24", acrylic on canvas, and has been SOLD,private collection. This painting is actually a few farms that I put together in one painting. Manitoulin Island is a beautiful place with strong family farm communities, and I just love being on the island. This painting is 16" x 20", acrylic on canvas, and has been SOLD, private collection. This painting is similar to one I did last year, and I decided to paint another one. Sometimes gazing out a window when I'm unsure about something can have a calming affect, and can reveal a new pathway to try. This painting is acrylic on canvas, 16" x 20" and has been SOLD. Private Collection. This picture was taken last spring when two of my paintings were chosen to hang in the AGH. They were included in a group show with the Womens Art Association of Hamilton (which I belong too). It was a great 3 month show, and an honour to be chosen and included with such talented women. I saw this old barn window last fall, and was immediately intrigued by it. I have a collection of old pitchers that I love and added them to this painting because I thought they would fit into it well. This painting is 16" x 20", acrylic on canvas, and has been SOLD. Private Collection. This painting is a combination of a few different windows around my home, and the view is from my imagination, so I put them together into one painting. This painting is 16" x 20", acrylic on canvas and has been SOLD/Private collection. This painting just kind of evolved on me. I had painted the background, and then put it away because I didn't know what I wanted to do with it. I found it shoved on a shelf just recently, and started to stare at it, and remembered when I was a little kid up north, and how reflections would show up out of no where it seemed, forming a beautiful backdrop to the white of the Birch Trees. This painting is 16" x 20", acrylic on canvas,And has been SOLD, private collection. This is a variation on light and shadows that I have been working on and I am very drawn to how those elements seem to chenge at different times of the day. I have been trying to create the feelings that I get when I look at them. This painting is quite simple in presentation, but the feeling I get from it, is that of a quiet summer evening. This painting is 16" x 20", acrylic on canvas, and Has been SOLD. Private collection. I absolutely love how this painting turned out! It took me a while to paint it but I am so happy with the end result, that it was more than worth the effort. I love the colours, I love the feeling, and I love just looking at it, it makes me feel good! It is 16" x 20", acrylic on canvas, and has been SOLD, private collection. This old doorway has been and inspiration for me as I've driven past it for years, and every spring this incredible Magnolia tree bursts open with these huge pink blossoms. Like the painting "Wisteria Doorway" that I did, this is also one of my favourite images. When the tree is blooming, it is almost impossible to see the front door, or much of the front of the house. Every spring I wait for this tree to bloom, because I know that there's no turning back, spring has arrived! This painting is acrylic on canvas, 16" x 20", and has been SOLD,Private collection. This painting was based on one of the old homes I drive past alot and every spring it is covered with this beautiful wisteria vine, that almost completely surrounds the front door. It has twined itself up and around the front of the house well up past the second storey. I'm sure it's almost as old as the house is! This painting is 16" x 20", acrylic paint, and has been SOLD. Private collection. This is a lovely painting, very "quiet" in feeling, and one that I enjoyed working on. I felt like when it was done, it might be a front door that I would like to arrive at after a long day away, and be greeted not only by the lavender scent, but also a cat waiting for my arrival home. This painting was chosen to be included in a group show at the Art Gallery of Hamilton, from February 22nd, 2009 to March 25th, 2009. It is 16" x 20", acrylic on Canvas, and has been SOLD, private collection. This Painting was a joy to paint. I love the open doors leading to the woods out back, I love the colours, and most of all I love the calico cat. I had a lovely (large, about 18lbs) calico cat for many years, named Maddy. She was very sweet and very shy, and would often just sit at our back door watching the world go by. Occasionaly she would venture out, but never very far, and never for very long, but when she did, she loved to lie in the sun. This painting is 16" X 20", acrylic on canvas, and has been SOLD, private collection. As I have said before, I love to paint old windows, and sometimes the views that are seen from them are quite wonderful. I called this one Blue Skies becuase there is nothing more up-lifting in the early days of spring, than to look out and see the blue of the sky and know that the promise of spring is just around the corner. This painting is 18" x 24", acrylic on canvas, and has been SOLD, private collection. This painting is of the view from my sister's bathroom window! I have painted 3 different paintings of this scene and this is the third version. 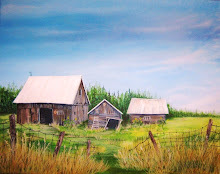 She and her family,live in a wonderful old farmhouse in Eastern Ontario, and much like my old home, there is inspiration for paintings everywhere! She took a photo of this scene last fall when she was planning on re-painting the window frame, and when she showed it to me, I fell in love with it. It is 18" x 24" ", acrylic on canvas, and has been SOLD/Private collection. This painting was a different way of painting for me. I wanted to do something was a little abstract, and a completely different feeling. I actually dreamt about this painting, and couldn't wait to put brush to canvas. It was a very impressionistic way of creating a work, and it was a great way to loosen up from my usual very structured paintings. This painting is 16" X 20 ", acrylic on canvas, and has been SOLD. I love this painting for alot of reasons. I love it because of the mix of red colours that I used, and how the open door invites the viewer inside. The gold/brown colours inside the house give off a feeling of warmth. The black and white cat is also special to me as we had a sweet little cat named Charlie for 20 years who greeted everyone at our door. This painting is currently part of a group show at the Art Gallery of Hamilton, and will be on display there until March 22nd, 2009. It is 14" x 20", acrylic on canvas, and has been SOLD, private collection. This stairway is loosely based on a stairway that is in my home. We live in an old farmhouse, about 100 or more years old, and it has some wonderful old quirks in it that lend themselves to some great inspiration for paintings.This painting is 11" x 14", acrylic on canvas, and has been SOLD. Private Collection. This painting was one of my favourites. The stained glass was a challenge for me but I was very pleased with the end result. Sometimes I like to paint doors and windows that are open, because it causes the viewer to wonder what is beyond this opening.This painting is 16" x 20", acrylic on canvas, and has been SOLD.Private Collection. 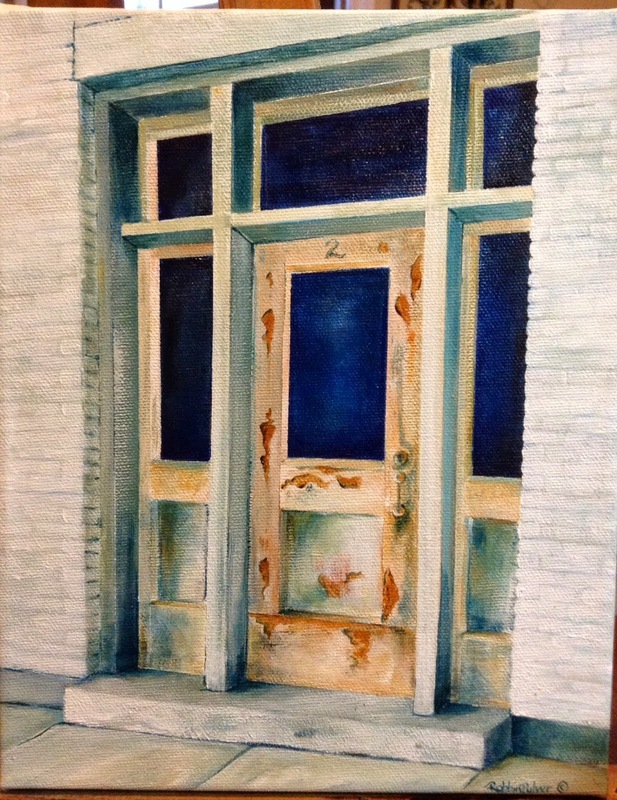 I love to paint old windows and doorways, and this was one of the first ones that I did. It was a dark, humid,stormy day at the end of the summer and the white flowers just really seemed to catch my eye. This painting is 11" x 14" and is acrylic on canvas and has been SOLD/Private collection. I love to paint old stairways, doorways,windows etc. because I find them intriguing. I feel they have a story to tell. There is a history that has happened all around them. Stairways often make me wonder where they might lead too, and how many footsteps have passed over them.This painting is 14" x 18" and is painted in Acrylic paint on canvas and has been SOLD, private collection. This is a painting that I did loosely based on one of my dogs as a model. She is actually a beautiful large German Shepherd, and although she does have some silver and tan markings, her face is completely black. I have had so many people stop me over the years, and ask me me if she is a wolf, partly because of her size and long legs and because of her markings. I love fall colours, and we do so much walking in the woods with our dogs, and because she is so dark, I thought these colours would create a dramatic painting.This painting is actually not for sale, as one of my sons fell in love with it, and it is hanging in his room. In 2006, I suffered a serious spinal injury, and then had surgery to help try and repair the damage that had been done. It was a long road to recovery, and I was left with permanent damage to some of my nerves and muscles, making it impossible to return to work. I didn't have a clue what I was going to do after that, and my future seemed rather uncertain. That was until my family started to encourage me to return to my love of drawing and painting.Being an artist was always a dream of mine, but was always on the back burner, something I'd do when when I retired! I have now been showing and selling my work since 2008, and I've had a wonderful reaction to it, and an amazing time creating it! It is an absolutely wonderful feeling to have someone look at a piece that I have created and love it enough to want to take it home! 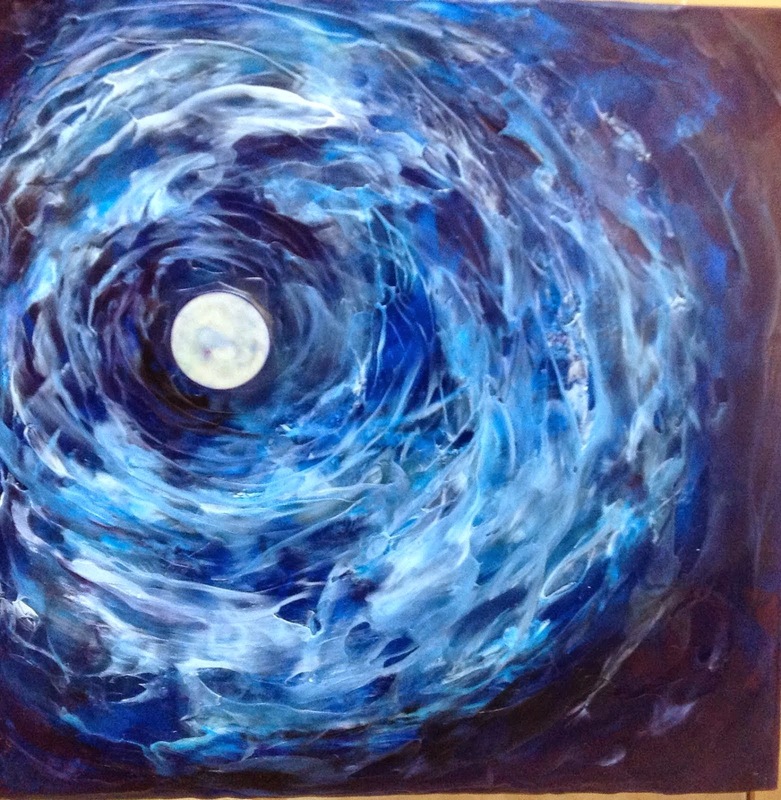 My work is mostly in acrylics, because I love the dynamics and versatility of them. I have also experimented in mixed media/encaustic collage pieces and these applications can have some wonderful results! I have a small studio in our one hundred year old farmhouse, where I live with my family and my beautiful German Shepherd.